Ever wondered what the Asus AM3 motherboard would have look like if it was DDR3-based, then the answer would be something like this board, the 785GM-E65 from MSI. 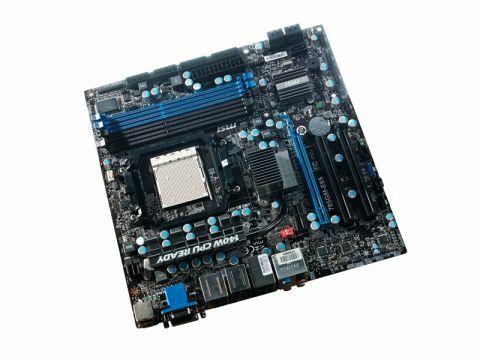 Based on the same AMD 785G northbridge and SB710 southbridge, on the face of it this offers near identical features as the cheaper Asus board. There's the single x16 PCI-e slot, six USB ports, five SATA ports, the single eSATA port, plus the PATA channel and a full range of VGA/DVI and HDMI v1.3 video outputs from the integrated Radeon HD 4200. However, a little closer inspection does show that the extra outlay procures you a motherboard with a few refinements. For instance, the heatpiped MOSFET cooler that connects to the 785G cooler is a good touch. The stacked SATA ports help ease installation of drives in a tight case. There's a floppy connection plus headers for FireWire, a parallel and serial ports, if you need them. A dedicated 128MB for the onboard graphics, all alongside onboard overclocking controls. On the side Many of the legacy extras may go by the wayside unused, the additional cooling is still welcome as it will enhance stability and longevity of the board. The extra 128MB of frame buffer DDR3 is a welcome extra, not for performance but for saving the integrated graphics from stealing main system memory. This AMD board supports the ATI Hybrid Graphics system, so you can drop in a HD 2400 or 3400 for a 'speed' boost. Again,this could be handy if you have an old graphics card lying around, but it's not something you're going to plan on using in a new system. In terms of integrated performance the MSI scores 1,568 in 3DMark06 and the ASUS 1,414. So they're not of use beyond generating a home cinema HD display, which as they support the encrypted HDCP this enables you to drop in a Blu-ray player for complete home cinema capabilities with those integrated graphics. With a loaded system running a Radeon HD 4890, the Phenom II 965 draws a whopping Bloomfield-level 226W. For a Media Center that's a lot. Using just the integrated graphics with Cool 'n' Quiet enabled the loaded results still hits 170W, while the idle results is a far more respectable 56W. In performance terms the DDR3 certainly boosts the AMD throughput to a DDR2 topping 12.78GB/s, which is a good 32 per cent ahead of the near-identical AMD DDR2 board. This however seemed to do little for the majority of the results. In 3DMark06 the MSI just nosed ahead with 16,531, while Cinebench was just behind at 14,024. Most significantly the encoding test peaking at 77.29fps, by far the highest here even beating the Core i7 920 by a margin. But we can put that down to the Phenom II running at a speedy 3.4GHz. So those SSE encoding pipelines can run rampant on the streaming data. Even overclocking was good with the FSB reaching 226MHz using the supplied Overclocking Center Windows utility and the raft of complete CPU and memory BIOS settings. If you're happy with a single x16 PCIe slot then this motherboard with the AMD processor will make a solid gaming system.